With message recall, a message that you sent is retrieved from the mailboxes of the recipients who haven’t yet opened it. You can also substitute a replacement message. For example, if you forgot to include an attachment, you can try to retract the message, and then send a replacement message that has the attachment. Message recall is available after you click Send and is available only if the recipient has an Exchange account within the same organization. In the folder pane, choose the Sent Items folder. Open the message that you want to recall. You must double-click to open the message. Selecting the message so it appears in the reading pane won't allow you to recall the message. Under the Message tab, choose Actions > Recall This Message. NOTE: If you don’t see the Recall This Message command, you probably don’t have an Exchange account or the feature isn’t available within your organization. Click Delete unread copies of this message or Delete unread copies and replace with a new message, and then click OK. If you’re sending a replacement message, compose the message, and then click Send. You send a message to someone. You recall the original message and replace it with a new one. On the recipient's computer, under Tracking, the Automatically process requests and responses to meeting requests and polls check box is selected. NOTE: To view this setting, File > Options > Mail. Scroll to the Tracking section. Both the original message and the recall message are received in the recipient's Inbox. Assuming the original message hasn’t been read, the original message is deleted and the recipient is informed that you, the sender, deleted the message from his or her mailbox. NOTE: If the original message is marked as read (viewing in the Reading Pane isn’t reading in this scenario) when the recall message is processed, the recipient is informed that you, the sender, want to delete the message. However, the message remains in the recipient's Outlook folder. On the recipient's computer, under Tracking, the Automatically process requests and responses to meeting requests and polls check box isn’t selected. If the recipient opens the recall message first, the original message is deleted, and the recipient is informed that you, the sender, have deleted the message from their mailbox. If the recipient opens the original message first, the recall fails, and both the original and recall messages are available. On the recipient's computer, either by rule or by action of the recipient, the original message is moved out of the Inbox to another folder and the recall message remains in the Inbox (or it is moved to another folder also). 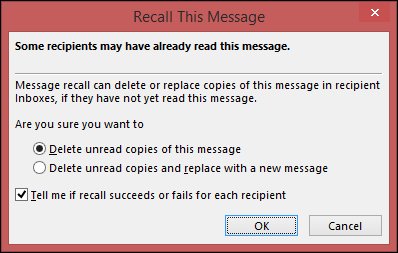 If the recall message and the original message exist in separate folders, the recipient receives a message that states a recall attempt failed. This occurs regardless of the Outlook configurations and the read status of the message. The original message and the new message are both available to the recipient. On the recipient's computer, either by rule or by action of the recipient, both messages are moved to the same folder. This results in behavior similar to what occurs when Outlook isn’t configured to automatically process messages. If the recipient opens the recall message first, the original message is deleted, and the recipient is informed that you, the sender, deleted the message from his or her mailbox. If the recipient opens the original message first, the recall fails, and both the old and new messages are available. You send a message to a public folder. You recall the original message and replace it with a new one. If the recipient who reads the recall message has read access to all the items in the public folder but didn’t read the original message, the recall succeeds, and only the new message remains. You, the sender, receive a message that states the recall succeeded. If the recipient has already marked the original message as read, he or she is informed that the recall failed, and only the recall message is deleted. If a user who has any other public folder rights opens the recall message, the recall fails, and the user receives a message that states the recall failed. Both the old and new messages remain in the public folder. If the recipient reads the original message and then marks it as unread, it is considered never read and recall is successful. In the public folder, it is the reader's rights, not the sender's, that determine the success or failure of the recall.